We have listed below some of the common questions we receive from first-time and returning customers. Please feel free to reach out to us if you have any questions. Our fitters are specially trained to help our customers find the best and most comfortable shoes. Many people think that all we need is a foot tracing to determine size. But shoe fitting is more complicated than that. Your foot is three dimensional and your shoe size is, too. Many first-time customers, who come to us because the shoes they have been wearing are too narrow for them, think all they have to do is move up to a wider width. We suggest selecting the Fit Me option when you order. Please be aware the best way to fit shoes is to try them on. Despite our best efforts, there may need to be a couple of returns and exchanges to find the best fit for you. Once we know your fit, reordering will be much easier and less-time consuming. What does Fit Me mean? STEP 1: Select product you would like to purchase and enter your approximate shoe size and width. STEP 2: Select the Fit Me option from the 'YES/NO" drop down menu. STEP 3: Click Add to Cart and proceed until step 5 of the check out process. STEP 4: To help us determine your size, fill out the form in the Enter Measurements section in Step 5 of the checkout process. 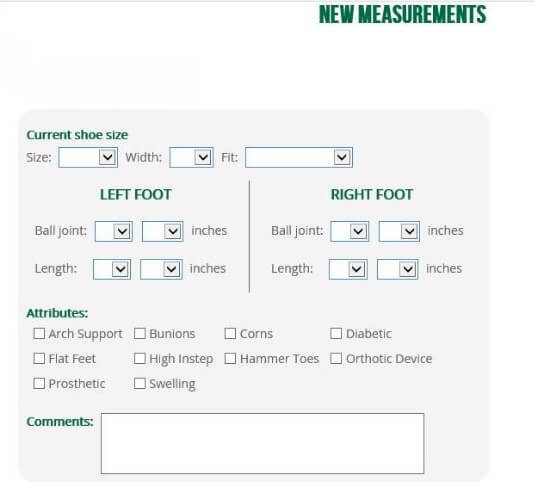 STEP 5: Fill in your ball joint measurements, tick any Attributes pertaining to your feet and complete the Comments section with any other information which may help us. Remember: The most important piece of information that you can provide us is your ball joint measurement, which is the measurement all the way around your foot at its widest point. STEP 6: Complete the checkout process. You will have a chance to review your order before purchasing. STEP 7: Our fitters will evaluate the information provided and, using their knowledge of our shoes, will send a size and width for you to try. We will contact you if we have any questions. If you are not satisfied with the fit of your new shoes, it's easy to exchange your shoes, giving us your feedback. (Please remember that shoes must be in original "as new" condition to be returnable. We recommend wearing your shoes on carpet in your home to determine if they fit you). Once we've established your proper size in our shoes, reorders are seldom a problem. What information do I need to provide you? If you are a first time customer or you haven't purchased from us in a long time, then the online form New Measurements, shown in step 5 of the checkout process needs to be completed before your purchase. 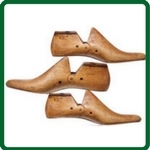 We will need your foot size, width and ball-joint measurements. We combine this information with your shoe history (if you are a returning customer) and any foot tracings (if you are a first-time customer) you may provide. The more information that you can give us, the better equipped our fitters will be in finding size and width matches to suit you. Of course, we cannot guarantee fit (only your feet can tell you what is best for you), but we will work with you until we find shoes that you find comfortable. Our fitters have years of experience and an excellent record of helping our customers. If you have purchased from us recently, we already have your measurements, so feel free to continue to step 6 of the checkout process. The term "last", quite simply, is the wooden or heavy plastic form over which a shoe is constructed. Since few factories have the lasts and other equipment to make shoes wider than EE, we have had to develop the special equipment needed to make shoes in widths to 8E. Our lasts all have the extra fullness wide feet require, but they vary a little to suit the particular type of shoes made on them. Thus, a 10EEE is both a wider and a longer shoe than a 10 D or 10 E. Similarly, when you add a half size of length, you gain not only 1/6 of an inch more room from toe to heel, you also gain about 1/8 of an inch more girth. What this means is that a person coming to Hitchcock Shoes for the first time should discard most of their preconceived notions about their shoe size. The size that you have been wearing from ordinarily shoe stores may not be your best size at all. So, if you are unsure of your size when you order from us, selecting Fit Me in the order section and completing all the information you can in the New Measurements (step 5 in the ordering process) will help us.